SFBayAreaKoiClub.org - The cuticle or slime coat. The cuticle or slime coat. Dr Paula Reynolds describes it very eloquently, in Koi-Carp Magazine, August 2000. 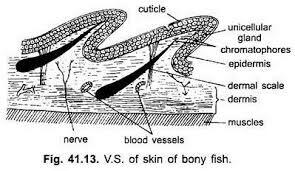 "The outermost body protection for koi is the mucus coating which forms a layer known as the cuticle. The mucus is comprised of natural secretions containing antibiotics, which are the proteins that fight disease. Primarily the mucus prevents the adherence to the body by pathogens such as bacteria, virus and parasites. These antibiotics produce a general response to all the harmful organisms in an aquatic environment rather than targeting one harmful organism specifically." The enzyme lysozyme and other secretions termed bacteriolysins, are also found throughout the mucus layer, defending the fish when under attack by diseases. Complement is the term applied to the system of interlinks enzyme reactions that take place in the mucus layer and also in serum. The mucus layer also contains unwanted matter from skin cells which some body parasites use as a source of nutrition. It is from this layer that the very small amount of mucus is removed to be viewed microscopically when a parasite problem is suspected. The consistency of the mucus layer can be changed by diseases. When nitrite is in the water the koi can take on a soapy appearance as this substance interferes with normal mucus production. In other cases the mucus becomes thicker or even watery or can be shed altogether as it mounts a variable response to health problems. A koi striped of its mucus coating becomes more vulnerable and that is why chemicals that removes it, such as formalin has to be used cautiously.